Having watched the recent TV programme on John Motson's retirement I thought I would dust off this tribute to one of Motty's mates. More senior football fans will never need reminding that arguably the most famous FA Cup giant killing of all time occurred at Edgar Street when then Southern League Hereford United eliminated Newcastle United in the 3rd round by 2 goals to 1 in 1972. Ronnie Radford’s wonder goal from about a mile out won prize after prize and accolade after accolade but so many people forget that the winning goal in that game was scored by Ricky George. Ricky of course had made his mark with Barnet Football Club playing in that superb team of the late 1960’s. Barnet bred Ricky was born in 1946 and attended East Barnet Grammar school. He has fond memories of watching Barnet from the terraces as a boy with his elder brother Mike, who also went on to represent Barnet in the Athenian and Southern League. “It was a much more community minded club then, nearly all the side that played at Wembley in the Amateur Cup Final were from Barnet itself”. Ricky started his footballing career as an apprentice with Tottenham Hotspur in 1961 at a time when Spurs were at the height of their powers having won the League and FA Cup double. He signed professional terms at White Hart Lane and then had spells at Watford, Bournemouth and Oxford Utd before joining Hastings Utd in the Southern League where he first teamed up with another Bees legend Bill Meadows. They became firm friends notwithstanding the fact that they travelled to games together from their homes in North London. When Hastings ran into financial troubles in 1968 the whole squad were given free transfers. Barnet manager Dexter Adams was never one to miss out on quality and Ricky soon joined Southern League Premier Barnet describing them as the best team he have ever played in. The forward line of Colin Powell, Les Eason, Meadows and George was to say the least formidable, and they all scored goals for fun. John Barr- Jimmy Lye, Roger Thomspon, Peter Jenkins, Ben Embery - Gerry Ward, Barrie King - Colin Powell, Les Eason, Billy Meadows and Ricky George. Ricky’s first goal in an amber shirt was against Arsenal in the London Challenge Cup in September 1968. Barnet ran out 4-1 winners against a side that contained numerous First Division regulars and household names. Another special occasion was in March 1970 when all of the aforementioned players scored all the goals in an 8-1 mauling of Mosseley in an FA trophy tie at Underhill. Ricky scored two, laying on four others. 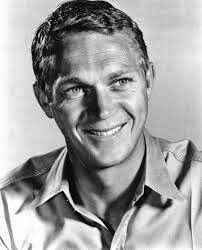 However his greatest performance was reserved for the visit of Division 4 club Newport County to the Hill in an FA Cup 1st round tie in November 1970. Ricky scored a hatrick in the 6-1 win, the result still in the record books for a non league team victory over a football league side, and was the star man grabbing headlines in the national press. In the FA Cup 3rd round of 1971/2 Hereford were drawn against then First Division Newcastle United. In the astonishing 2-1 victory Ricky won possession setting up Radford for a famous equalising goal. The tie went into extra time and Ricky struck the incredible winner. The goal sparked the mass pitch invasion in which every young boy who leaped around in the thick mud seemed to be wearing a Parka coat! Along with Radford, Ricky has become part of FA Cup folklore and his achievement is always referred to every year the FA Cup comes around. Football TV memories at their best. 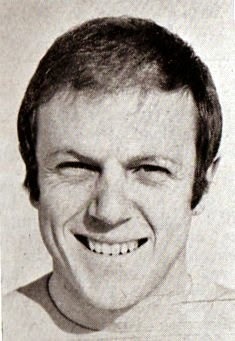 Ricky had returned to Underhill as a player by Christmas 1972 when Hereford were elected into the Football League. “It was an old boys reunion, Les Eason, Ben Embery, Paddy, Gordon Ferry, were all still there under the great Gerry Ward’s management” said Ricky. “Later when Brian Kelly was manager he loaned me out to Wimbledon and I played for them against Barnet, the only time I ever played against “my club” at Underhill, it was very strange. I remember walking down the tunnel turning towards the away dressing room after the game and Stevie Toms shouted ‘get in here George you don’t bloody belong in there!’ It was then, sitting with all my old mates that Stevie told me about another dear friend Bees goalkeeper Jack McClelland’s serious illness. That was tragic, Jack really loved the place, a lovely man and a great goalkeeper”. 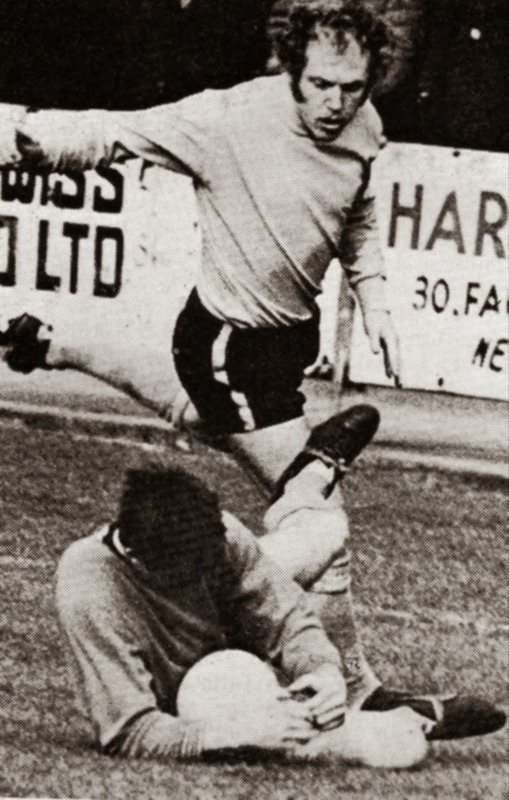 Ricky’s second spell at Underhill amounted to a further two and half years until the Autumn of 1975 when he joined Cambridge City and then Borehamwood before returning briefly to Underhill for a "swan song" in August 1976.His final game in amber and black was 6th November 1976 as substitute in a 4-0 win at Underhill over Andover. Barnet; Wilf Woodend - Steve Oliver, Walter Lees, Marvin Hinton, Terry Tapping - Terry Price, Bob McNab, Gary Williams - R Aggio, Johnny Fairbrother, Dennis Brown sub Ricky George. He then retired from playing although turned out for a couple of season with East Barnet Old Grammarians. One story from fellow EBOG Derek Finch goes "After a game on Hackney Marshes somewhere Ricky pulled a hair dryer out of his bag and asked where the plus socket was? The players went into hysterics!" Ricky started and ran a successful sportswear business travelling the world until 1992 when along with five others he bought a share in a racehorse called Earth Summit. In April 1998 it famously won the Grand National at odds of 7/1. 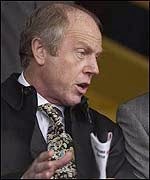 In 1992 he was made President of Barnet Youth FC and unsuccessfully tried to link with Barnet and Chairman Stan Flashman. “Stan didn’t want to know unfortunately and I said ‘it's not going to cost you any money Stan’, we were self sufficient. It could have been an unofficial academy”. In 1994 he again returned to Underhill this time in the guise of Chairman. “Stan and Barry Fry had left and Edwin Stein was manager with a new board of Directors. Eddie then moved on and I appointed Gary Phillips as the new manager. I fell out with a few people at the club because it was an awful time, but that is all forgotten now. 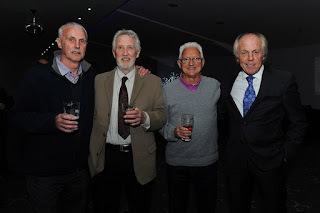 There was a real danger at one point that we'd do an Aldershot and go back five leagues to Diadora 3, but that fortunately that never happened”. Alongside Phillips he performed miracles piecing together a squad to represent the club in Division 2 in the wake of the infamous promotion winning season and subsequent administration turmoil when virtually the whole Barnet playing staff were granted free transfers by the Football Association. For that contribution to our club alone we should all be eternally thankful. Ricky published his autobiography One Goal One Horse in 2001. If you haven’t read the book here is the hard sell. It is of course lavishly decorated with fond memories of all things Barnet, but it is also a fascinating insight to a world so few are privileged to experience. “It represents the untold thousands of professional footballers who never got a chance to tell their story” read one review. It is extremely funny in places and more senior Bees fans will recognise characters that to the average reader will sound made up, but I assure you they are not. Ricky and TV legend John Motson are very close friends and the Motty on Tour evenings features Ricky as Motty's straight man. Ricky gets his limelight spot too!. Their show a couple of years back at the Wyllyotts Theatre in Potters Bar was superb and all the stars of the shows and members of the audience (many ex players from many clubs) walked over to the Bar in the Old Manor - now that was special to be invited to join the inner circle. Ricky wrote a non-league football column for the Daily Telegraph and was a regular summariser on BBC radio. He even crops up on Hawksby and Jacobs on Talksport radio from time to time and very entertaining he is too. His roots remain securely in Barnet, although he lost his beautiful Wife Pat last year, and he can often be found enjoying a round of golf at Old Fold Manor in Hadley Highstone. He is a regular at the Hive too and its always a pleasure to spend time with him. He is a Mate. Ricky is also a Barnet boy – always will be.